2 Gatling Turrets on each side. 1 Gatling Turrets, and 1 Missile Turret on the bottom. 1 Interior Turrets inside the Cargo Hold. 1 Interior Turrets guarding the Large Reactor. The specific antenna that spawns drones has a range of 795 meters and is named: "Hostiles detected - Requesting Backup". This antenna within range will spawn either a Incisor or less frequently a Eradicator drone in defense; They are much more formidable with the later being a serious threat, in the unlikely event it spawns. They will spawn 3000 meters away from the player and every 5 minutes up to a total number of 2 drones active any time. Alternatively, there is a landing pad on the ship's back (shown in the cut-away below), but it has a Missile Turret directly in front of it. Use many decoys (can be real Decoy or any block moving with more than 3 m/s) to distract the turrets. The weak spot of this ship is at the back end, between the large thrusters. The main reactor is only protected by a thin layer of light armor. Disable the reactor, and the ship will be defenseless. The ship's cockpit is directly behind the right side Spotlight, located on the ship's top. On either side of the ship, toward it's back, there is a large doorway (made up of armor blocks) underneath large yellow awnings. (shown above by the large hole through the ship, in front of the Large Reactor) Entry can easily be gained by slipping through the large gaps either side of these doors. In front of the landing area on top of the ship is a Door that leads (via vertically placed Passage Blocks) to the upper level of the cargo area. The refineries are also connected to the conveyor system. Note the Refinery may process some of these ores before you gain access. There is 1 Large Reactor, and 1 empty small reactor. 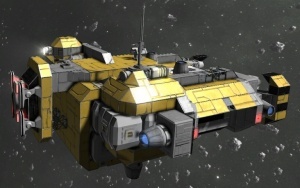 As of v.1.030 (list), the new Mining Hauler has lost it's booby trap but gained 2 Interior Turrets. Due to the working weapon systems, it gained six additional small cargo containers. The improved Conveyor system is connected to all large cargo containers, several Connectors and Collectors. This page was last modified on 27 January 2017, at 21:53.